Grid 2 – First Impressions! As driving game enthusiast, I have kinda felt starved for a good driving game. Don’t get me wrong, there has been a few published over the last year but none of them seemed to capture enough to spend top dollar on buying and the ones I had played were fun, but lacking something. So, for a time, my void was being filled with other genres. But this month, Sony was generous enough to provide a meal that was surprisingly good and completely off my radar. For anyone who hasn’t played Grid 2, I recommend giving it a try if you have a itch for driving games. Now, you may be thinking that Need for Speed Rivals just came out a month ago, what about that game? And to answer that question, I’ve played it already and sadly enough it wasn’t much there to digest. If you played Criterion’s Hot Pursuit series, you will know EXACTLY what I mean. Rivals to me is nothing more than Hot Pursuit with an open world feature. There was nothing innovative here. No new concepts for me to get used to. And the Rival’s world is painfully small and quite similar to its predecessor. 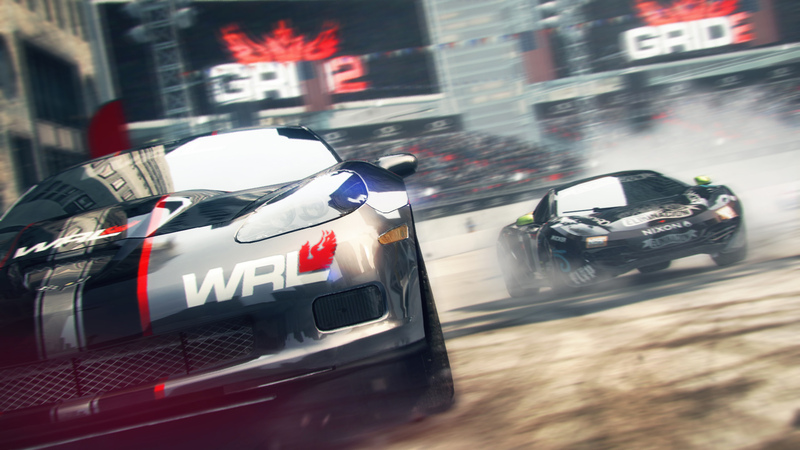 Grid 2 comes from the team Codemasters and its second iteration in the series. Unfortunately, I won’t be able to do a comparison because I have yet to play the first one but I can offer a fresh new opinion to a series. For the record, I will only be speaking about the single player campaign as the Online feature of the game is completely separate. 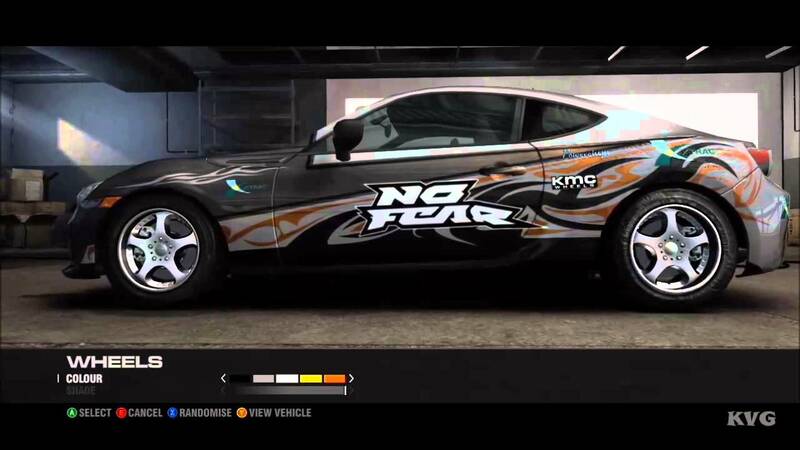 Grid 2 opens with you being a no name driver in Chicago right before a street race and this is the way Codemasters lets you get your bearings. No tutorial. No hand holding. It treats you like you already know the scene and rules. Once the counter reaches zero, push it for s top three finish. Grid offers a unique blend between arcade racer and a driving simulation. Car handling borrows a bit from your usual arcade games but the addition of real world physics creates a truly unique experience. Do not think you will just brute your way through corners and turns and the game will not punish you for it, especially if you are behind the wheel of a rear-wheel drive vehicle. Drifting in this game requires a plotted strategy, a feel for the road, and a good relationship between you and the car. Also, the physics applies to the car as well. Hitting walls and other drivers will damage the car and alter the car’s performance. 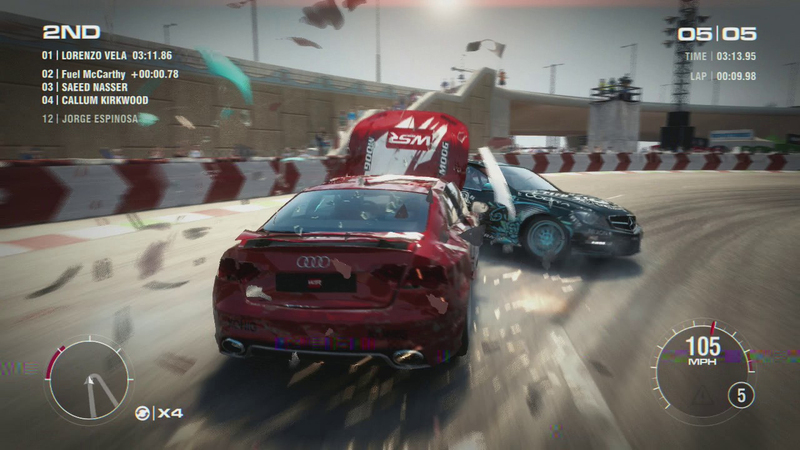 Smacking a wall could cause the car to pull to the left or right for the remainder of the race while a head on collision at top speed can completely total the car and end the race. It becomes an art form to weave in and out of opponents, deciding in seconds whether or not to take to the inside to pass for the lead or hang back for a better opportunity. Managing these factors with an A.I that isn’t shy of trading paint if necessary add to the difficulty and to the overall thrill of tearing up tracks and passing opponents going over 180 miles-per-hour. Once you’ve finished your opening race, you find out that you are the up and coming poster child for the new World Series of Racing, a new organization aiming to bring together the world’s best drivers and pit them against each other to discover the world’s finest with you leading the charge. You travel to locations all across the globe, from Chicago Paris, challenging driving clubs with A list racers to get them to join your circuit and Codemasters doesn’t disappoint to give an array of cars to burn asphalt in. Customization in this game can be a bit bland, but there is enough variety there to keep your cars looking fresh and polished if you want to get your creative juices flowing. You learn that as World Series of Racing flagship racer, you goal is accumulate fans by participating in events and other challenges throughout your career. So far, my experience with the career mode has been nothing short of fantastic. Grid 2 offers you a good variety of driving disciplines to master with enough even types to keep things fresh and exciting. Drifting contest, time attacks, and elimination challenges are some of the usual events we expect to see but the unique endurance, overtake, and live route promotion events added flavor to break the usual races and one-on-one duels. As you compete, you are offered and awarded cars after events or to participate in certain races. This allows you to focus more on the racing and less about fine tuning your car specs. Grid 2 car selection is all over the place. From Nissan Fairlady Z to Honda NXR, the selection requires you to learn the differ aspects of each car and then decide which one is the best option for a specific event. Faster doesn’t always mean victory here and those that heeds that advice will be better off. Grid 2 so far has offered me a fresh experience in the driving genre. Sure, it isn’t game of the year material, but does it have to be? Unique and challenging driving mechanics, beautiful locales and gorgeously rendered cars, and a solid campaign filled with fun and variety creates a memorable experience and I’m not even done with the game yet. Oh… here is some gameplay.